Nicaraguan farmers Filadelfo Sotelo and his son Cesar Eduardo Sotelo had very little time to spend with their family. 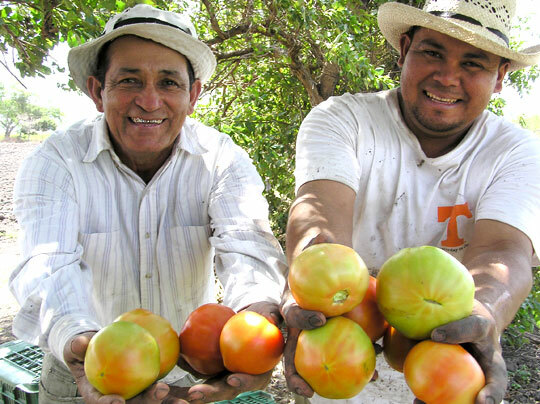 They worked long hours farming crops such as beans, corn, tomatoes, and passion fruit. They also performed odd jobs just to make ends meet. Despite this, they never had quite enough to eat. To make matters worse, they had lingering debts and no more access to credit. For years, a series of unfortunate events such as economic instability, crop pests and civil war had conspired to render all their efforts futile. Today, with TechnoServe's assistance, the Sotelo family is reaping the benefits of their hard work, and their lives have been transformed. TechnoServe taught the Sotelos how to cultivate their land more effectively, using better seeds and seedlings grown in mini-greenhouses, controlling pests with environmentally friendly means, and adopting drip and gravity irrigation methods. Business advisors helped the Sotelos become suppliers to La Colonia, one of Nicaragua's largest supermarket chains. The quality of their fruits and vegetables has increased, and they no longer sell to intermediaries who manipulate prices. In less than three years, their revenues have grown by 4,000 percent. The changes in their lives are notable. They have paid off all of their debt and returned to creditworthiness. They have reconstructed their houses and improved their diets, and they can now afford to send other family members to school. For the first time in their lives, they are able to invest in the quality of their lives. They've purchased new mattresses, a television, and a stereo. Despite their recent successes, the Sotelos still believe in hard work. "Our next goal is to buy a truck, so we can deliver our tomatoes and peppers directly to the supermarket," says Cesar Eduardo Sotelo. "We are going to buy more land and begin supplying La Colonia with more products."